The United States presidential election of 1792 was the second quadrennial presidential election. It was held from Friday, November 2 to Wednesday, December 5, 1792. 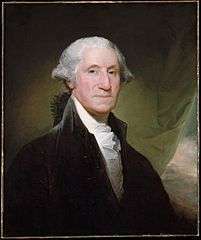 Incumbent President George Washington was elected to a second term by a unanimous vote in the electoral college. As in the first presidential election, Washington is considered to have run unopposed. Electoral rules of the time, however, required each presidential elector to cast two votes without distinguishing which was for president and which for vice president. The recipient of the most votes would then become president, and the runner-up vice president. 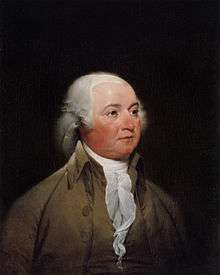 Incumbent Vice President John Adams received 77 votes and was also re-elected (Washington received 132 votes, or one from each elector). This election was the first in which each of the original 13 states appointed electors (in addition to the newly added states of Kentucky and Vermont). It was also the only presidential election that was not held exactly four years after the previous election, although part of the previous election was technically held four years prior. The second inauguration was on March 4, 1793 at the Senate Chamber of Congress Hall in Philadelphia. In 1792, presidential elections were still conducted according to the original method established under the U.S. Constitution. Under this system, each elector cast two votes: the candidate who received the greatest number of votes (so long as they won a majority) became president, while the runner-up became vice president. The Twelfth Amendment would eventually replace this system, requiring electors to cast one vote for president and one vote for vice president, but this change did not take effect until 1804. Because of this, it is difficult to use modern-day terminology to describe the relationship between the candidates in this election. Born out of the Anti-Federalist faction that had opposed the Constitution in 1788, the Democratic-Republican Party (sometimes simply called "Republicans", although there was no connection to the modern-day Republican Party) was the main opposition to the agenda of Treasury Secretary Alexander Hamilton. They had no chance of unseating Washington, but hoped to win the vice presidency by defeating the incumbent, Adams. The Republicans would have preferred to nominate Thomas Jefferson, their ideological leader and Washington's Secretary of State. However, this would have cost them the state of Virginia, as electors were not permitted to vote for two candidates from their home state and Washington was also a Virginian. Instead, they settled on Governor George Clinton, though Jefferson would receive the votes of four Kentucky electors. The elections of 1792 were the first ones in the United States to be contested on anything resembling a partisan basis. 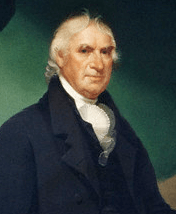 In most states, the congressional elections were recognized in some sense as a "struggle between the Treasury department and the republican interest," to use the words of Jefferson strategist John Beckley. In New York, the race for governor was fought along these lines. The candidates were Chief Justice John Jay, a Hamiltonian, and incumbent George Clinton, who was allied with Jefferson and the Democratic-Republicans. 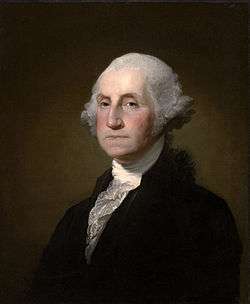 Although Washington had been considering retiring, both sides encouraged him to remain in office to bridge factional differences. Washington was supported by practically all sides throughout his presidency and gained more popularity with the passage of the Bill of Rights. However, the Democratic-Republicans and the Federalists contested the vice-presidency, with incumbent John Adams as the Federalist nominee and George Clinton as the Democratic-Republican nominee. 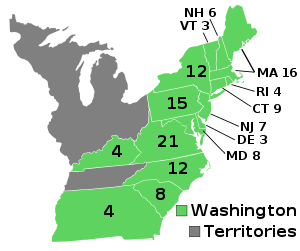 With some Democratic-Republican electors voting against their nominee George Clinton – voting instead for Thomas Jefferson and Aaron Burr – Adams easily secured re-election. Only two states, Pennsylvania and Maryland, cast popular votes. Overall there were 28,579 popular votes cast for presidential electors, a record low turnout for a United States presidential election. ↑ "The Electoral Count for the Presidential Election of 1789". The Papers of George Washington. Archived from the original on 14 Sep 2013. Retrieved May 4, 2005.